ELKHART – The action was so intense that the paramedics showed up. 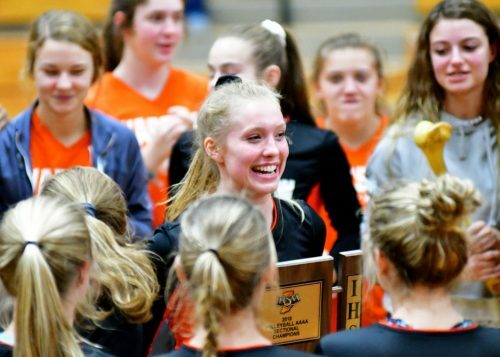 Warsaw was able to cap a very wild day of volleyball with a 3-0 win Saturday night in the championship of the Elkhart Memorial Volleyball Sectional, winning its first championship since 2004. Perhaps a heartstopping performance for the Tigers, which were pushed to the limit in the morning semi-final by Memorial then pressured by the Northridge Raiders, which were playing with nothing to lose. 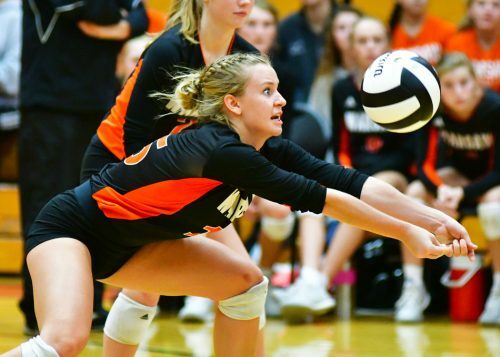 After surviving a five-setter against Memorial in the morning session, Warsaw came back to face Ridge in the final, and quickly found themselves down 3-0 in the first game. But as the night would morph into a series of streaks, Warsaw would take the next seven points. Ridge would get the match as close at 16-14, but Warsaw would rattle off eight of the next nine points, sparked by a Kacy Bragg kill and tip. At 25-17 Warsaw in game one, a slight look of relief beset upon the Tiger faces. Gwyn Bellamy reacts after scoring the championship point against Northridge. As Ariana Grande’s Bang Bang played over the Memorial speakers ahead of game two, the Tigers started to look like the loose and energetic bunch that came into the night with 28 wins. 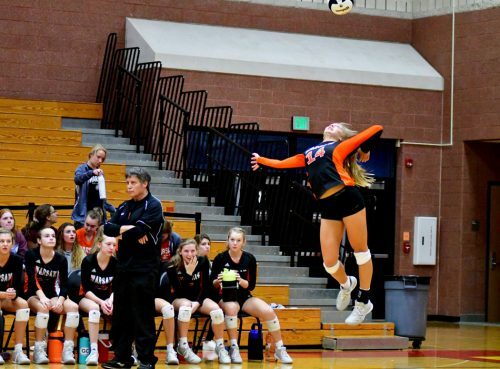 Another clever tip to space by Bragg pushed the Tigers to a 14-6 advantage, and Katie Swanson blasted a big kill to run the score to 21-14. Ridge would post a mini rally, getting the score back to 23-16, but the gym would go silent at Elkhart paramedics walked into the gym. Responding to a heart monitor call for Warsaw supporter Fred Nieter, the moment was shifted into laughter as Nieter had tripped his device rooting on the Tigers and asked the paramedics to hold his remote so his Tigers could finish out the set. A Swanson kill and illegal hit on the Raiders closed out a 25-17 second set, leaving Nieter and the Tiger supporters jovial. A 25-23 third set saw some good volleyball by both sides. Bragg again had a pair of tipped shots into space to score points, Cora West had a huge dig that led to a point, and the seldom used Gwyn Bellamy pounded home the championship point. Katie Swanson holds the championship trophy among her Warsaw teammates. Bellamy finished with eight kills, Betty Barnett had 10 kills, Erin Peugh slid into the libero and had nine digs, as did Kylie Smith, and Emily Schmidt added 11 digs. Northridge ends its season 9-24 overall, but the growth head coach Jodie Steele saw in her team, particularly from the first contest it lost, 3-0, at Warsaw in early September, was marked. 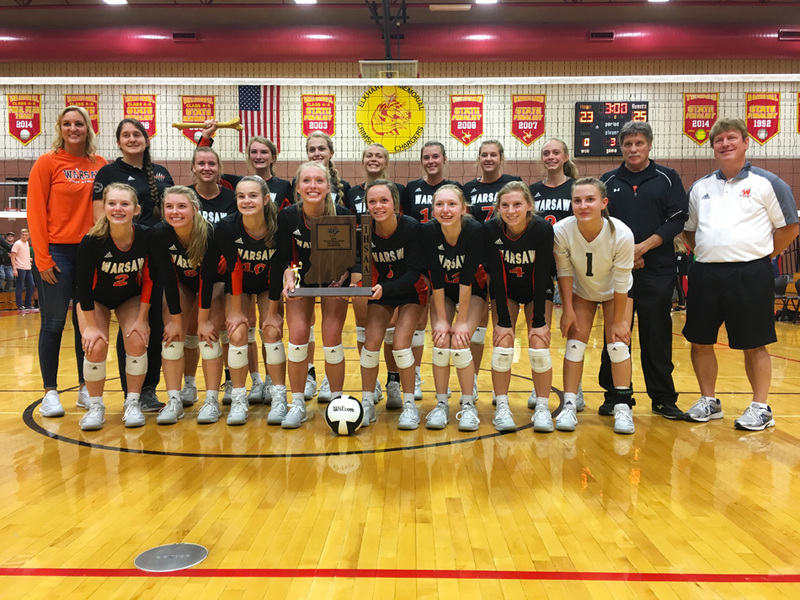 Warsaw, now 29-7 on the season and winners of 13 of its last 14 contests, will take on Michigan City (29-7) in the first game of the LaPorte Volleyball Regional next Saturday. The Wolves beat Warsaw, 2-1, in the championship match of the Michigan City in mid-September. Penn (31-5) and Munster (32-4) play in the second semi-final.